I swear this was the year of the berry. Blueberries, raspberries, wild strawberries and strawberries went in over drive this year. I had a couple of weeks that I picked this bowl over flowing with berries. We ate strawberries galore. I made a lot of strawberry freezer jelly. 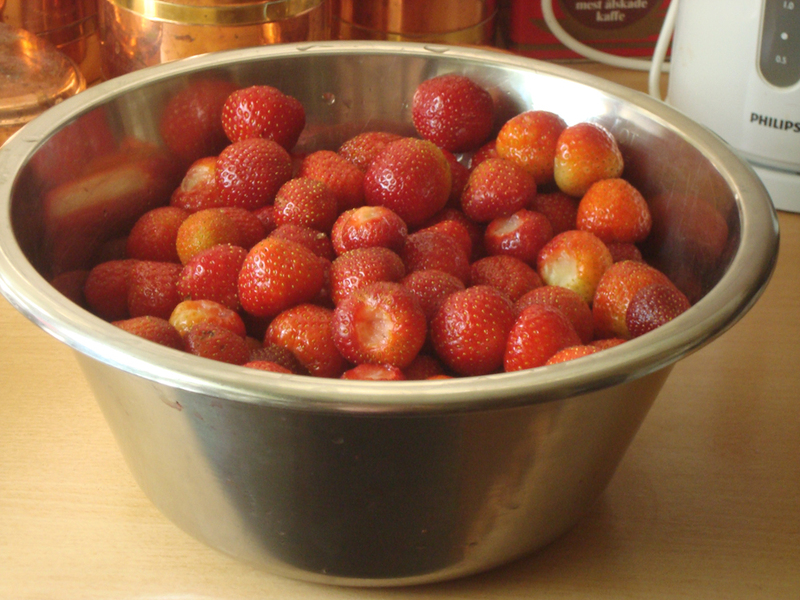 I gave away strawberries to friends, neighbors and family. Hubby is busy trying to figure out a 101 ways to eat freezer jelly ( on pancakes, waffles, cheesecake, frozen like ice cream…). I still have not picked any blue berries or raspberries. I had a neighbor who gave me some. Makes approximately 5 half pints. 8 cups of sliced strawberries (about 2 lbs). 1). Crush strawberries to get about 4 cups of crushed fruit. 2).Add lemon juice and stir. 3).In a separate bowl add pectin and sugar and mix well. 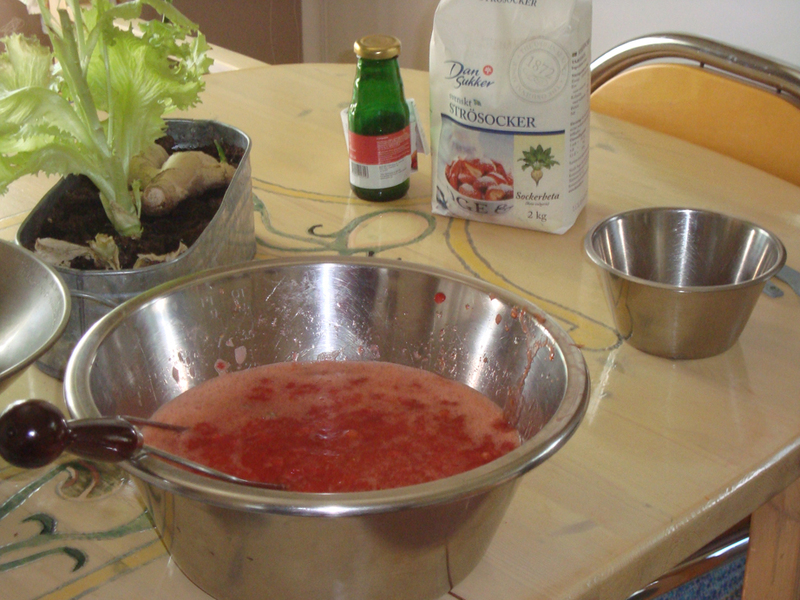 4).Add sugar mixture to strawberries stirring for 3 minutes. 5). add to freezer safe jars let sit out uncovered for 30 minutes. 6): refrigerate and use within 2 weeks or freeze for up to one year. I am such a fan of Mother Earth News. This is a great article giving you all a multitude of recipes to preserve your fall apples. I hope you like them as much as I do. 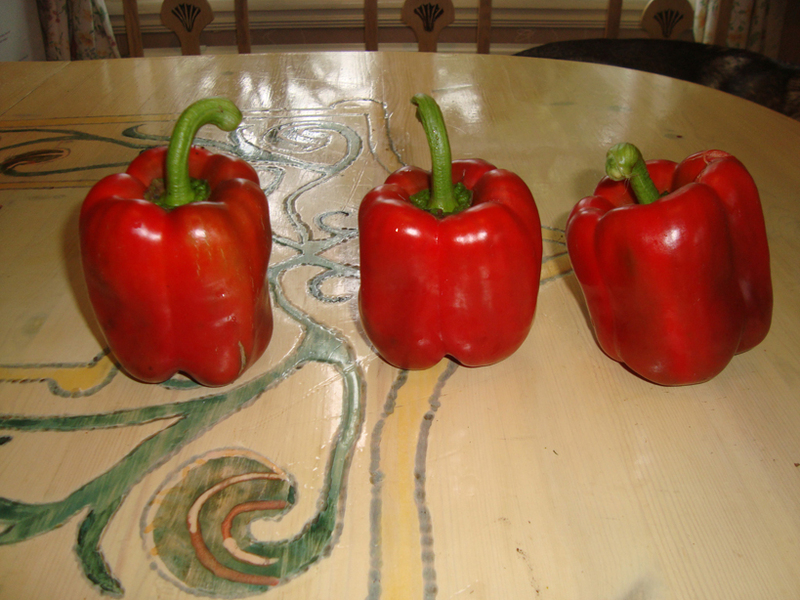 Our first 3 ripe bell-peppers of the year. I am pleased that they did so well. I am going to make stuffed red pepper with these tomorrow. There are 9 more bell-pepper almost ready to pick. We are going to freeze these for cooking later. Next year we will plant a few more plants. 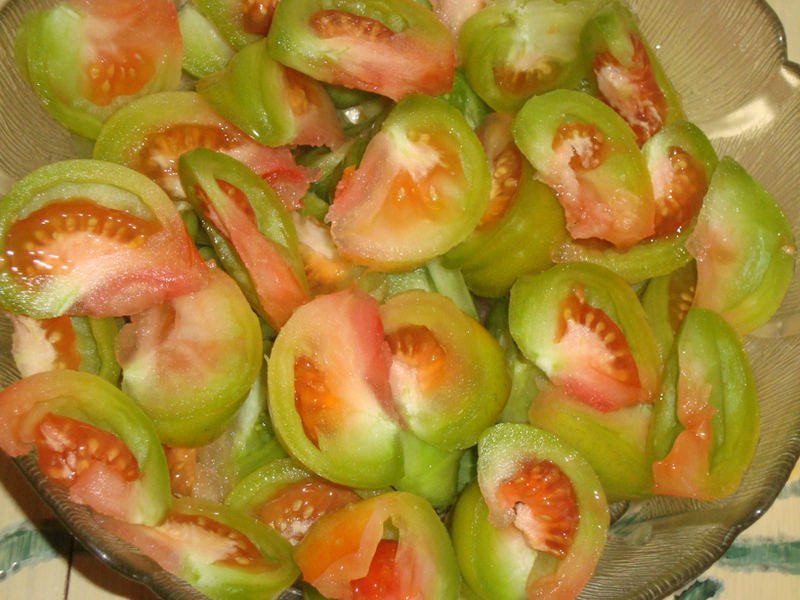 I am going to use these half ripened tomatoes for pickling. I think that they are very colorful and will make the pickled vegetables look appealing. 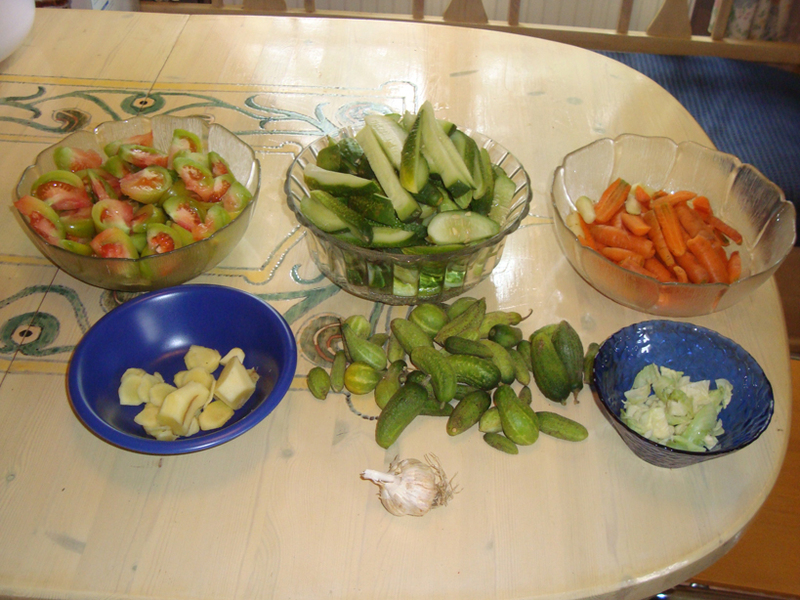 This is all the ingredients for the pickled mixed vegetable that we are canning today. I don’t weight anything any more because I have made them so many times. Don’t all the different color vegetables pop in those jars? This is a double batch. 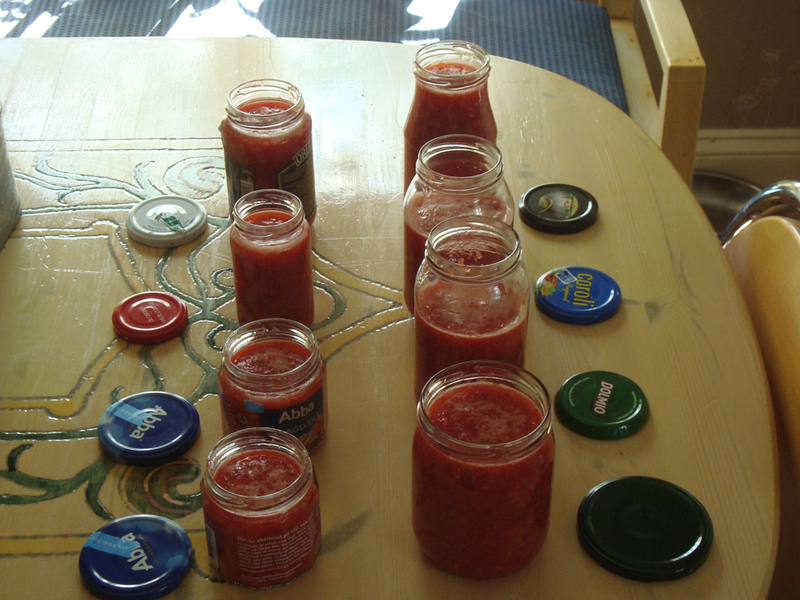 We made 11 jars. 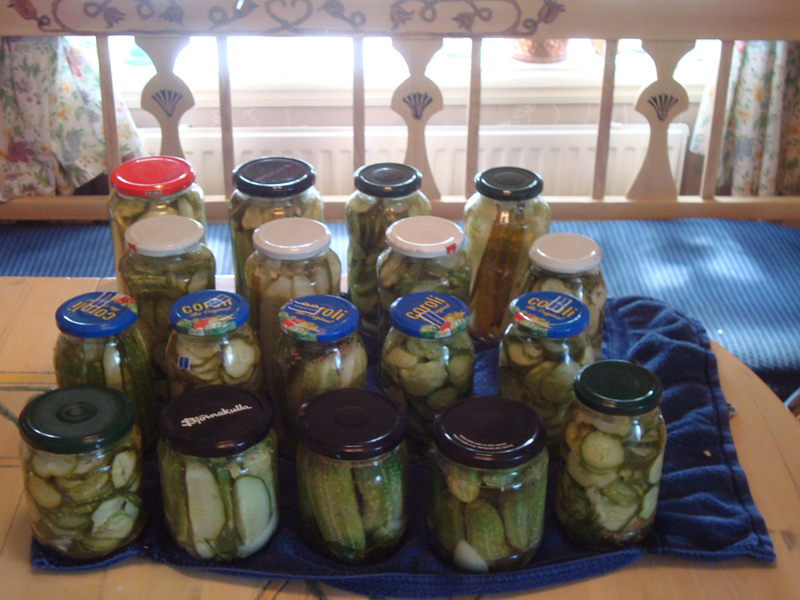 This is our last pickles for the year. I eat these with my dinner. Just a small portion wíth my meal aides my digestion. Rinse and dry vegetables. Cut them in even pieces. Mix ingredients for salt mixture and stir until salt is dissolved. Place vegetables in it except the horse-radish in the salt mixture for 24 hrs. Drain the salt water mixture out and rinse the vegetables off. Pour fresh water in the pan. Boil the vegetables with the Horse-radish 3-5 min. Drain the vegetables in a colander and rinse to quickly cool the vegetables off. Make the vinegar mixture and make a cloth pouch with the bay leaf, gold mustard seeds, and 10 white pepper corns in it. I bring it to boil. Sanitize your jars and lids. 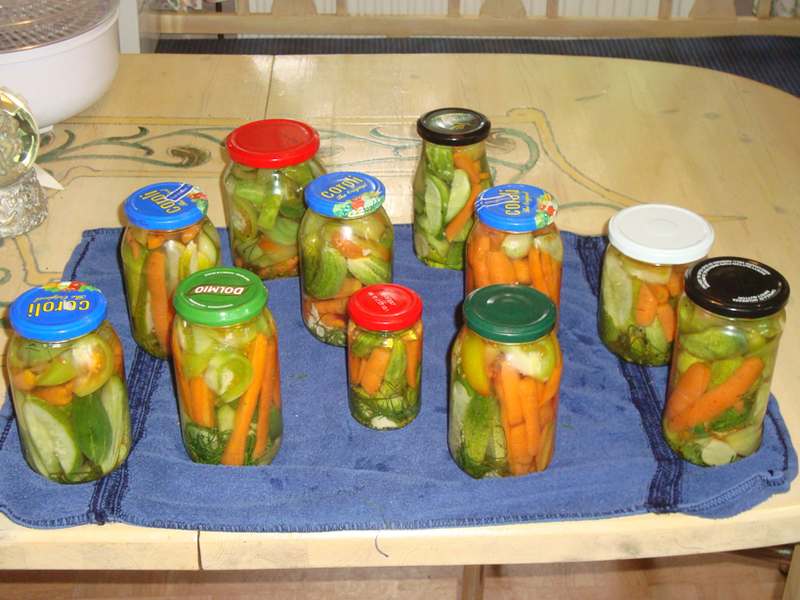 Stuff the jars with the vegetables and pour the vinegar mixture in the jar leaving a 1/4 inch from the top. Place the lid on tight. Repeat until you have filled all your jars. Let them cool on a towel but make sure the jars do not touch. dill weed from 6-10 stalks using only crowns and leaves. I sanitize my jars and have them in the sink in boiling water. I pour the vinegar mixture and place bay leaf, the majority of the ginger, mustard seeds, garlic and white pepper corns in a cheesecloth pouch that I tie off with string. I place the pouch into the mixture. I stir it until it is mixed well and let it boil. I cover the bottom of the jars first with dill, a thin slice of ginger,1/8 tsp of yellow mustard seeds and one bay leaf in each jar. Then I pack it tightly with vegetables. I can not stress enough that you need to pack it tight. Otherwise once you fill the vinegar mixture over the vegetables , they will float to the top. There will be a gap in the bottom of the jar. 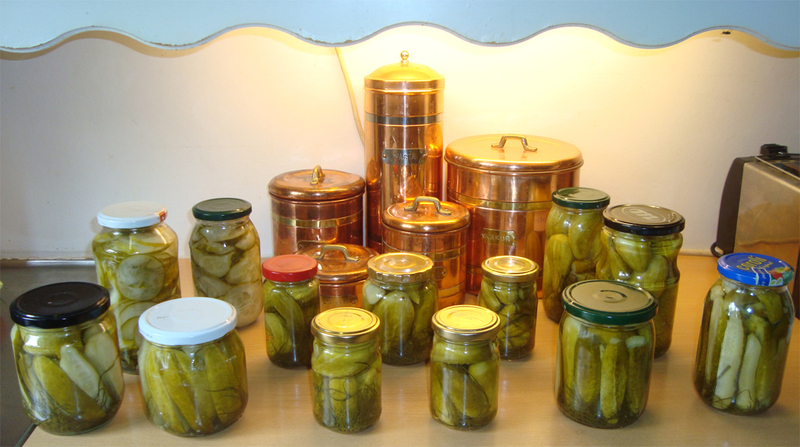 You waste space and use a lot more jars un-necessarily. I pour the vinegar mixture in the jars and place the lid tightly on them. I place jars on a towel and let the jars set for 24 hours before I store them. I let these set for 3 weeks in our cellar, before we start eating them. 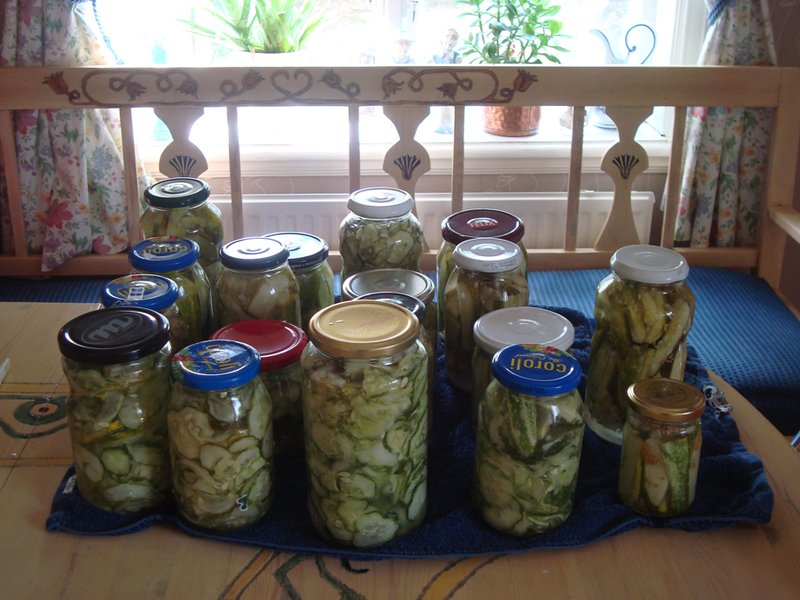 Last year I experimented with different pickle recipes. Each recipe has a little different flavor. All of them were delicious in their own way. The Salt brine pickles were a real surprise how well they turned out. I found in Sweden the only place that you can buy these are usually in a Deli here. They are a treat for us. I thought why not try to make them myself. I made only one batch of them last year. Hubby couldn’t get enough of them. I used table salt instead of pickling salt. The recipe didn’t specify it just said salt. I later found a recipe using pickling salt. I realized the woman who wrote the recipe assumed that I would know that. I am a newbie on canning. I didn’t know that. luckily the pickles were delicious. I thought they would be even better if they were a little less salty. That is not to say that I didn’t like them or eat them. He guarded them like they were gold. I just wanted to tweak the recipe to improve on it for our taste. I could not find pickling salt any where. That is why I cut the salt in half, when using table salt. Hubby agreed that they would be even better if I cut the salt in half. These were really popular with family and friends. I made these over the weekend. 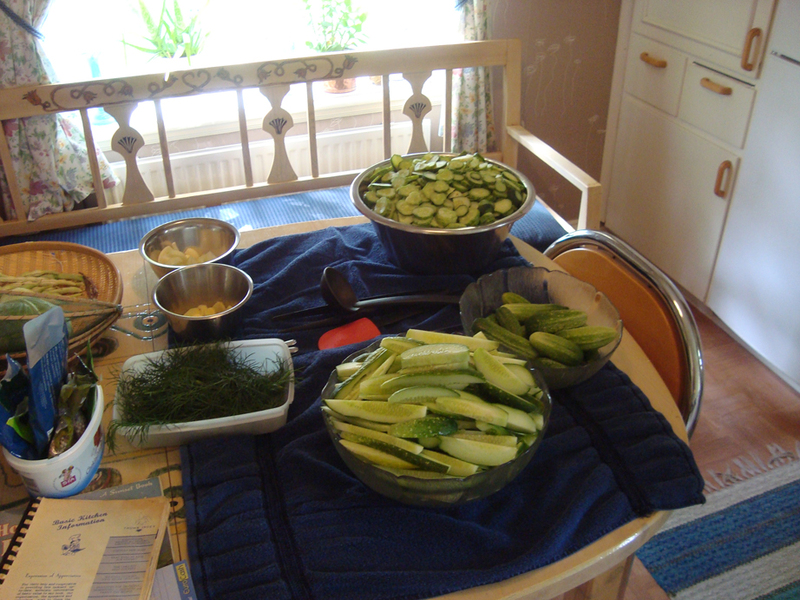 I figure I have one or two more batches left in my cucumber patch, before the patch is done for the season. 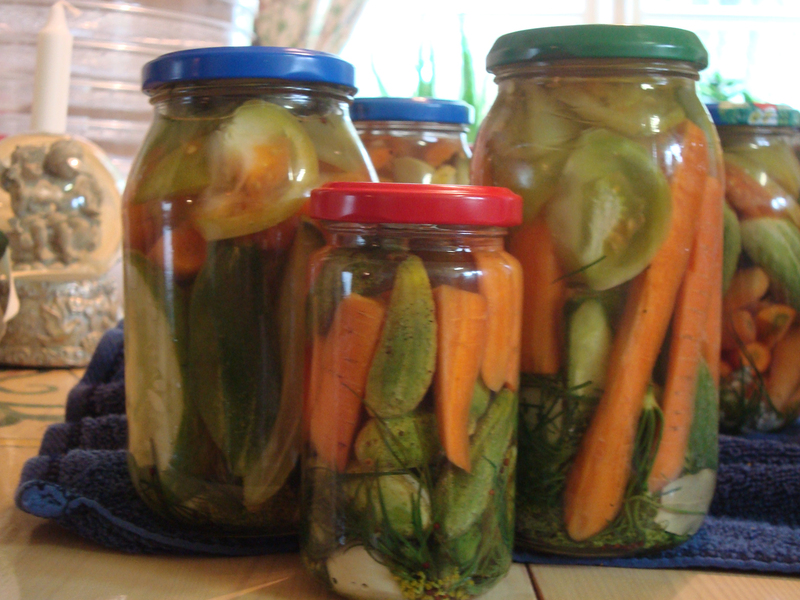 I will be using pickling them with this recipe. Canned Salt brine Pickle; 1 cups water 1 cup salt ( I couldn’t find pickling salt, used 1/2 cup table salt) 2 cups vinegar Dill Bring above mixture to a boil. Cool and pour over the pickles packed in jars. Seal. Can boil this and let it stand over night before using. I sterilize jars in boiling water and apple cider vinegar. I stuff a hot jar with pickles and fresh dill while mixture is boiling on the stove. I pour the hot mixture in the jar. I wipe off outside of jars and seal. I continue until all the jars are done. I place hot jars on a towel to cool slowly. I make sure the jars do not touch one another. I then place them in the food cellar for two weeks. They are ready to eat.